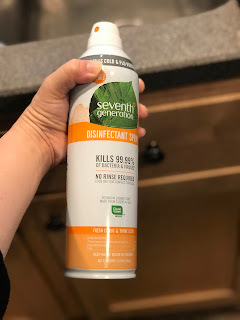 I really liked this product! If you use disinfectant spray at home then you already know what you like and don't like but a few features I liked: child proof, smell isn’t overwhelming and unpleasant, no wipe formula and made with botanical oils. With flu season here I’ve been using this spray in the kitchen and. on the kids toys. I received this product complimentary for my honest review and all opinions are my own.